The date is coming closer. Soon our baby will be born and we would like to know what it needs to guarantee its well-being. For not having to hurry up in the last minute it is better to anticipate and get some things prepared about one month before the predicted date of birth. During its first days of life it will usually be in hospital, therefore it will only need a few things. The best is to take 5 or 6 bodies (please keep in mind that in case of Cesarean you will have to stay in hospital for a minimum of 5 days) and for being unexperienced you are likely to soil them. Don't forget to take three or four pyjamas with you (better if they have feet) and a few bonnets. You will also need a few lullabies. Normally the matrons will provide you a list of things you will have to take to hospital on the day you will give birth. Read it carefully and ask yourself what is really necessary and avoid buying things you can buy later. Keep in mind that the day you will come home with your new born baby, your house has to be prepared for it. It is important that you already have a cradle or a prooved baby carrier for a safe home journey from hospital. The best thing to do is to set it up a few days before, so that we can be sure of not having any problem. It will be perfect having bought a pushchair or a high chair because sometimes it takes a few days or even weeks to deliver and the best is not to risk. If its is not fixed then try to fix it for making sure that there is no piece missing or that it it doesn't result too difficult to do. 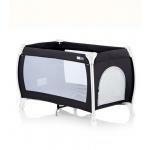 It is also necessary to have a cradle so that the baby can sleep well. Not only the structure but also the matrass, the bed sheets and blankets are important. Choose the best place in your house so that your baby can rest and make sure that everything is comfortable. Buy a pair of different dummies and prepare a small first aid case with alcohol of 70º and lints for the belly button. Don't forget the gauzes or humid towels. It is also useful to have already at home the bathtub in which the baby will have its first baths. For that moment it will be perfect buying specific bath gels and shampoos that are suitable to the skin of the new born and a cream for changing the nappies. You will need more things as time goes by and the baby grows but these are the most important ones so that that during the first days your baby will have everything. 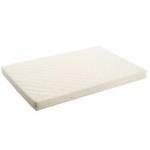 Mat for cribs ( specially Graco), for a comfortabel sleep. How to measure my baby?